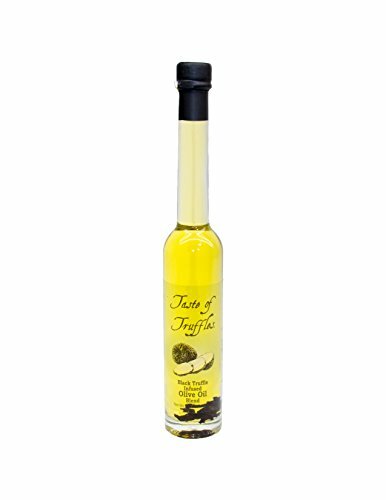 This BlackTruffle Oil, made from Blend of Extra Virgin Olive Oil, Sunflower Oil and Grape Seeds Oil, which keep intact the Taste of Truffles and make it Unique, Exclusive and Distinctive Finishing Dressing Oil. Extra Virgin Olive Oil Blend, Flavor of Fine Summer Black Truffle (Tuber Aestivum) 6%. ALL NATURAL Flavor and Ingredients USED into the Production. This is a condiment oil to refine the taste of your dishes and used for dressing only. NOT to be used for cooking, frying or sautéing Great for variety of dishes such as pasta, fish, salad, pizza, eggs, meat and more. Suggested serving size: 1 /2 table spoon. Black Truffle Oil Blend, to keep intact the Taste of Truffles and make it Unique, Exclusive and Distinctive. Extra Virgin Olive Oil Blend, ALL NATURAL Flavor of Fine Summer Black Truffle. ALL NATURAL flavor and ingredients. Design for Home Cooking and Professional Kitchen and Chefs. If you have any questions about this product by Taste of Truffles, contact us by completing and submitting the form below. If you are looking for a specif part number, please include it with your message. Organic White Truffle Extra Virgin Olive Oil, 3.38 fl. Oz.